This is a two-day walk, and it requires a high level of fitness. It spans a total of 45 km across all of Mt Čvrsnica. It includes three peaks of over 2000 MASL, as well as Hajdučka Vrata and Lake Crvenjak. This route on Mt Čvrsnica is quite demanding, even if you split it into two days, as you have to cover 42 km. The departure point is at Muharnica, a place located 2-3 km behind the entrance to the Blidinje Park. The macadam road leading to the peak of Veliki Vilinac forks at this point. There is a junction that has a signpost, which makes the rest of the walk easier. The road is in a good condition, so you can cover another 3 km by car. If you plan to return via the alternative path i.e. to reach the Hajdučke Vrleti motel on Day 2, you need to drive for another 6 km in the direction of Lake Blidinje. There is a car park in front of the Hajdučke Vrleti motel. By taking the trail, you leave behind the Blidinjska Plateau and the beautiful Vran mountain. After a half hour walk from the departure point, you will reach a meadow with a small house and a well to the right. Near the house is a signpost pointing to the right, in the direction of the peak Veliki Vilinac. There are some wooden benches at the junction, where you can take a short break. The path is adequately marked and it goes on through the forest. Ascending the peak is not difficult because each incline is followed by a flat section of the road, allowing you to rest as you walk before the next gentle slope. In less than four hours, you will arrive at the junction whose right arm leads to the Vilinac lodge (15 min) while the left one takes you to Lake Crvenjak (30 min) and Hajdučka Vrata (45 min). If you have enough time, you can proceed towards the beautiful lake located at 2000 MASL, and take a break there. Hajdučka Vrata is only 15 minutes away from the lake and it would be a shame not to visit the place. It offers a beautiful view of Grabovica and Prenj in the distance. The peak of Drinjača (Trinjača) (2038 MASL) overlooks Hajdučka Vrata and commands an attractive view of Prenj. At the end of Day 1, you can rest at the Vilinac mountain lodge. 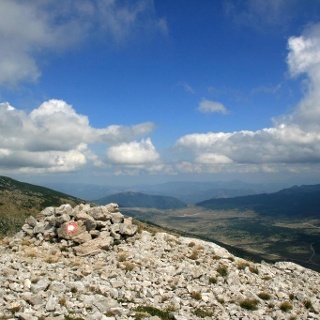 The peak of Veliki Vilinac (2118 MASL) is about 40 minutes walk from the Vilinac mountain lodge. The peak offers a view of another peak – Pločno. 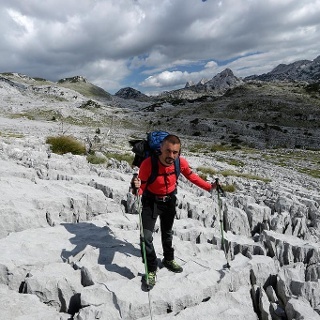 The trail leading to the peak Pločno starts by the lodge, with trails to the via ferrata in the direction of Grabovica, or to Pestibrdo (2035 MASL) branching off on the left. It takes about 3 hours to get to the junction whose arms lead to Pločno (1.45 h) and Masna Luka (2.30 h). Climbing the scree to the peak is quite difficult. The path to Masna Luka is not easy either because it runs across a steep slope full of slippery rocks. In the end, you need to cover about 6-7 km across flat ground to get to the Hajdučke Vrleti motel. Technically, this route is not demanding but it requires a high level of fitness. Although it is divided into two days, it is still challenging to cover the 42 km (17 km on Day 1 and 25 km on Day 2). Make sure to visit Blidinje Lake, only 6km from the motel. The Hajdučke Vrleti motel is also worth visiting as the staff is exceptionally nice to fell-walkers. The trail is technically undemanding (but it does require a high level of fitness). There is no risk of landmines. Standard mountaineering equipment, in accordance with the weather. In Risovac head east to Muharnica and take the macadam road to the wooden bench. This is where the marked trail leading to Veliki Vilinac branches off to the right (south). Follow that trail up to the junction for Hajdučka Vrata and turn left (east). Pass by Lake Crvenjak along the way. Just above Hajdučka Vrata is the peak Drinjača (Trinača). Go back the same way to the junction and this time turn left to Prijegon and the Vilinac lodge. About a hundred metres below the lodge (to the east) there is a spring. The road above the lodge (to the west) leads to the peak Veliki Vilinac. Go back to the lodge and continue to Pločno down the road leading southwest. 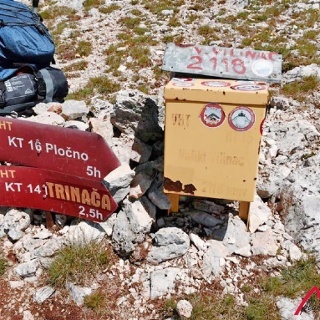 Go all the way to the junction to Masna luka, continue straight ahead and climb up the scree to Pločno. Go back to the junction and head to Masna luka. From there the road leads to the Hajdučke vrleti motel. Take a bus or train to Jablanica. When you arrive you will have to find transport to the Blidinje Lake. Take M17 to Jablanica. Drive into the town, then take R419 to Sovička vrata via the village of Doljani in the west. One short stretch of the road is macadam. The motel Hajdučke vrleti is 6km from the entrance to the Blidinje nature park. The motel is halfway between the start point and the end point. Ask someone at the motel to give you a ride to Muharnica (6 km) so that your car is closer on your way back tomorrow. You can park in front of the Hajdučke vrleti motel or at a lay-by along the way.